I just completed my second recycle pen art project in time to be shown at the Sonoma County Fair exhibit called “Greentivities“. “Greentivities”, is a new, fun, interactive, and exciting venue for both kids and adults to showcase examples to the community with ways to approach recycling, reuse and conservation through art and hands on demos. How I got there was a text book case of convergence. Last Wednesday I was walking around down town Santa Rosa and I run into Rebecca at the Share Exchange Coop who knew Anita at the Greentivities booth at the faire and suggested I contact her about a speaking gig. I then got a call from Anita and went down to see her Saturday to find out more and sign up to speak. I asked about submitting a pen art piece and she said “yes”… if I could get it to her within 48 hours. 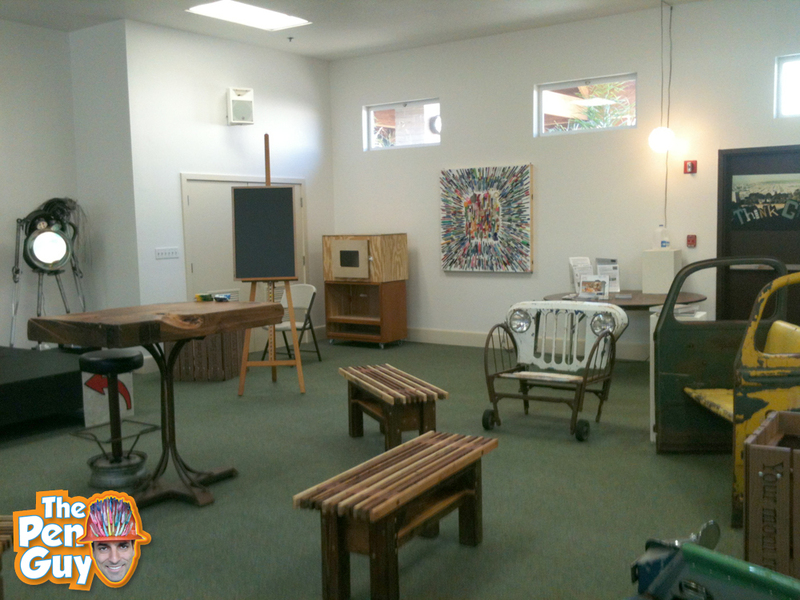 Needless to say I met the deadline and my second piece proudly hanging at the fair along with some great recycle art including a few art car chairs made by Patrick Amiot of Sebastopol, and amazing scrap metal drummset. What I love the most about this piece as opposed to my other one called “The Giving Tree” is that due to time constraints I didn’t have time to over think it too much so I just went with the flow and worked as quickly as I could to get-r-done. When I showed my wife for the time it has this amazing effect on her as if she was being pulled into it and experiencing a time warp as well. 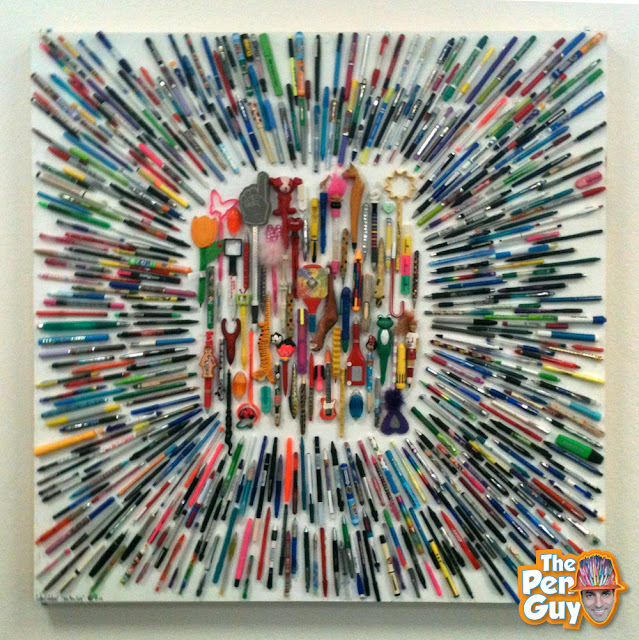 On this particular piece I got to reuse 448 donated pens. I also got to use some of my favorite pens donated from all over like the world. I have a Mummy pen, an etch-a-sketch, a french fry, pen again and the operation pen. I love it when things line up, especially all the pens. 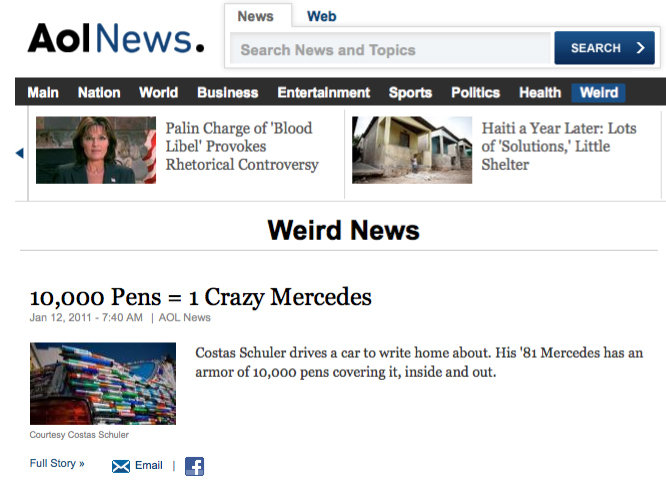 then on to a recent article on AOL news called 10,000 Pens = 1 Crazy Mercedes by Michael McLaughlin. 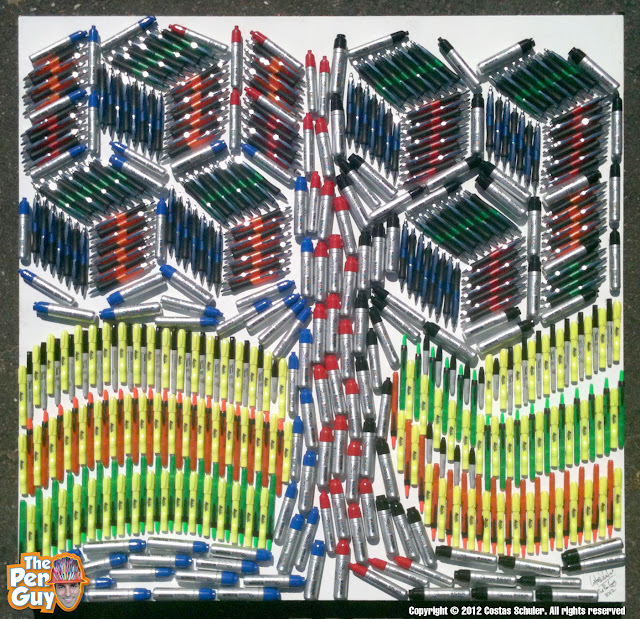 One of the many perks as the pen guy when I am no out back creating pen art out of donated pens is doing the odd pen review here and there. Today’s pen is brought to you by the Prank Place who sent me this pretty raw looking “Sushi” pen. If you love sushi, then you need one (or all!) of these great Sushi Pens! 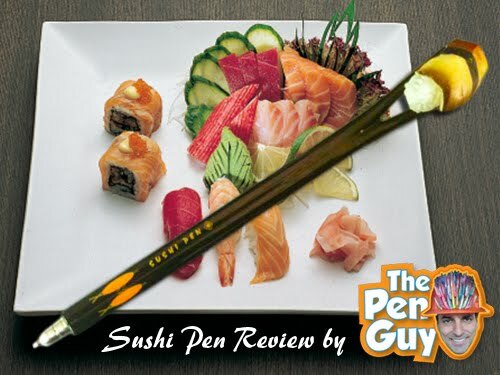 Each ballpoint pen writes with black ink, comes with its own ballpoint cover, and has a delicious sushi at the other end of the pen! On the pro side, its a great looking pen and does well for short notes and sushi phone orders. I would say a great addition to your pen collection or super duper deal if you owned a sushi shop. On the other hand its not really a good pen if you like to journal or write long notes. It doesn’t glide over the paper that well and the fact that the barrel is narrow makes it hard to handle and your hand will eventually cramp up. The sushi pen is unbalanced, top heavy and awkward to write with. I am sorry but I have to give the sushi pen a three out of five dead fish rating. 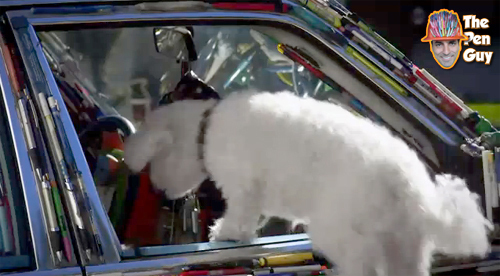 About a year ago the Mercedes Pens Art Car was hired to be in a movie called Doggie Boogie about Pijo the dancing Dog. Yesterday I run into the trailer and to my big surprise I found a brief shot of Pijo jumping in the Mercedes Pens from the passenger side. This was the scene right before the big chase scene, with a taxi cab going after Pijo in the back seat looking out. In fact a Pijo stuffed stunt double was used made from hair collected from the real deal. Not sure when the movie will hit the big screen but I am looking forward to my art cars big day on the silver screen. Its a very cute movie and the color scheme is simply magnificent, perfect movie to for The Mercedes Pens. I am happy to announce the creation of my very first art piece called “Giving Tree” a 48″x48″ piece covered with about 500 sharpies. I am also launching my Indiegogo fundraising campaign to raise $8250 to help me create another seven “pentings”. I have been collecting pens ever since I started the Mercedes Pens Art Car with the idea that I was going to create more art with used pens. 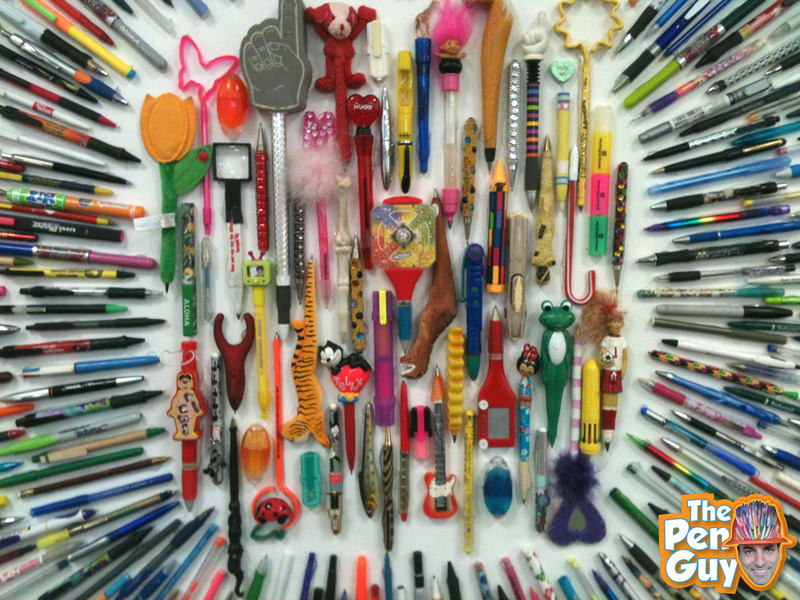 At the beginning of the year I had about 30,000 pens piling up and overflowing out of my pen bin in the back yard as seen here. Then I got a giant boost from TerraCycle who partnered with me by giving me a giant pallet of about 30,000 more used pens and then commissioned me to create two pentings. I took the opportunity from this first piece to launch a fundraising campaign and step out believing that this crazy pen art dream could really happen in the next 60 days. I have been thinking about this for many years and the timing was finally right to take the plunge and put my big dream out there. With the support of my family and close friends I take the step into what I believe to be an appointment with destiny and to go on to create some of my best work ever in the coming years. Tell your friends about it on facebook, twitter, email and the rest. Send your good thoughts my way.